so they make their guests do fan signs for the show and, of course, I had to ham it up now, right? 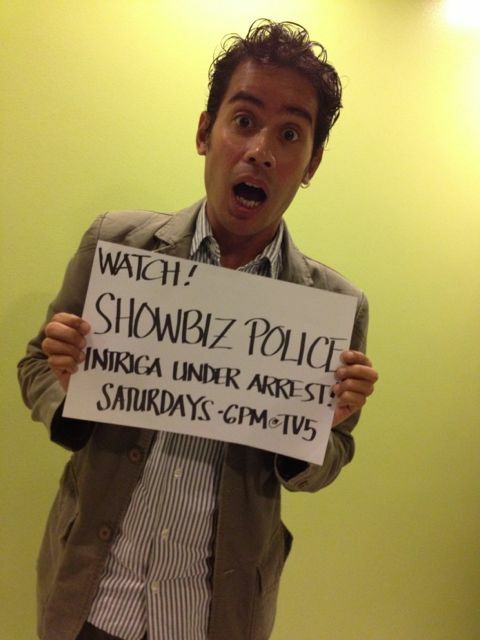 So, today I’m guesting on TV5’s Showbiz Police, on a segment called “Lucy’s Desk” with Lucy Torres-Gomez. I’ve been asked to share a bit of my experience living with HIV to help jumpstart a conversation on the new TV5 show called Positive, starring Martin Escudero. Positive is a weekly drama about a young man (Martin Escudero) with a wife, who is recently discovered to be pregnant, but he also discovers that his wild, youthful days came with a price. He discovers he is HIV positive. The show aims to inform people about the realities of HIV in the Philippines in a narrative drama of a person who has just got his life in order and now has to deal with the aftershocks of a reckless youth. In a way, there is a sort of reflection of my life. While Martin Escudero’s character is straight and has found someone, I can very much relate to having a wild past and then taking the steps into a more tame lifestyle and taking life more seriously only to find that I was a little too late. I got infected. I have big hopes. GMA7’s My Husband’s Lover managed to present a different perspective on gay relationships and gay people. It widened the imagery and allowed straight acting gay may a chance to be seen, understood, and seen as human beings rather than caricatures. I hope that Positive does the same for people living with HIV in the country. I hope that it provides a wider imagery and understanding of the lives of people living with HIV in the Philippines. I like the fact that Martin Escudero’s character is straight. It helps widen the scope and sends out a message that everyone who is active in risky behaviour is vulnerable to HIV infection. At the same time, knowing that Ruffa Mae Quinto is part of the cast, that signals to me that there will be humour involved and that’s important to me. Most stories about HIV in the country, especially what we see from Western media, is that stories about HIV is always so scary and dramatic and sad. I don’t think my life is dramatic or scary or sad. There are moments, sure, but it’s not all tears and self-hate and self-loathing. There’s a lot more, and the moment you deal and accept your situation, your life becomes better. You handle life differently; and it usually adds a layer of enjoyment. You tend to cherish every moment with more gusto, because you understand the concept of your mortality better. I hope that carries into the show. And Martin Escudero’s character has a supportive Mom, in the form of Bing Loyzaga. That’s also important for me. I have supportive parents and they helped me get through the darkest parts of this journey. It made things so easy and with their support, I was able to put my life back together. It’s important, especially in the Philippines, that we tell parents that they should be supportive and understanding. This little part of the show is important to me, as well. But most importantly, I’m extremely happy that Martin Escudero is playing the lead role in Positive. I’ve seen him in Zombadings: Patayin sa Shokot si Remington and he is an amazing actor. In that film, he played a young man who is cursed to turn gay because, as a child, he used to make fun of gay people until he was cursed by a witch. Martin Escudero managed to portray his transformation believably and with conviction. He was not afraid to be gay and punched each scene with just the right intensity. He wasn’t playing gay and then winking and nudging at the audience and letting them know that he was just acting; he was fearless in portraying the transformation as believably as he could. He was perfect. His performance was so nuanced and yet, at the same time, sensitive. He understood the campiness and comedy required, but projected the fear and panic of a straight guy who is slowly realising he’s turning gay. That sort of performance is a true professional performance and proof that he is a very, very good actor. I’m extremely excited that he’s the lead for Positive because if he can do what he did in Zombadings, then he will surely be able to handle anything they throw at him in the show. Now, let’s just hope they give him a good script to work with because if they do, then this show will truly be powerful and important. I got to meet him. He’s an awesome guy. I mean, sure, he’s really, really cute but more than that, he’s talented and he’s a really nice guy. He’s not full of himself and you can hear the sincerity when he talks about how hard he researched and prepared for his role in Positive. It’s great to see young actors who aren’t swallowed up by the fame and who treat acting as a real career and a profession. That’s what impressed me the most about him. I don’t really watch television anymore, but I think I will try to catch Positive as much as I can. I am hoping that the writing will be more realistic and I hope they don’t go for the easy drama. I’ve always wanted to see people living with HIV in television and film and that they are presented in a different way and Positive might be able to change the way people see us positive people. I want it to be able to expand the conversation and make more Filipinos talk about it and not be afraid to ask questions and to take the matter more seriously. I know I said I would never bring my advocacy into the entertainment world — to refuse to do interviews in an entertainment show and just bring my advocacy into public affairs and news programs — but Positive might help spread the information and remove the stigma of HIV in our society by showing a different side of living with HIV. So, if showing up in an entertainment show is going to help the advocacy and get people to watch the show, then I’ll do it. 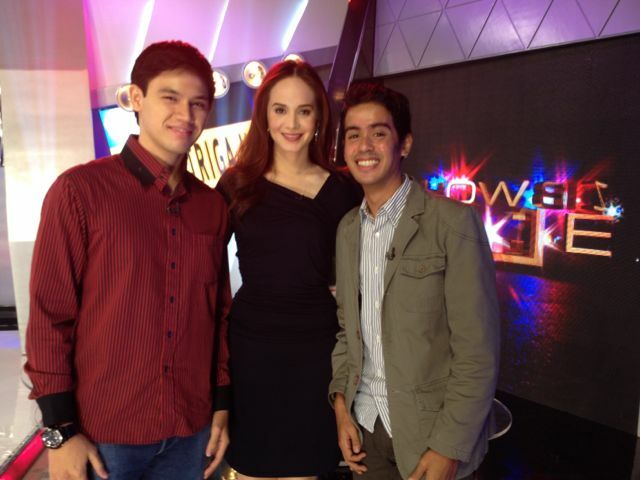 Catch Positive on TV5 starting October 17, 9:30pm.